Researchers study how microscopic organisms, key to carbon sequestration, evolve in the ocean, and implications for a warming planet. Averaging a life span of just a few days, 30 million marine microbes would fit in a shot glass, 100 in the width of a human hair. These organisms are tiny – just a single cell – but powerful when it comes to sequestering carbon dioxide. Marine microbes comprise more than 98 percent of ocean biomass: microalgae, bacteria, archaea, protozoa fungi, and viruses. Together, marine microbes account for almost half of all photosynthesis on Earth: sunlight and carbon dioxide in – glucose and oxygen out. Microbes are the engines that drive marine carbon cycling, regulating the climate as far as how much CO2 is sequestered in the planet’s oceans. Marine microbes are an invisible yet powerful element in carbon cycling. The health of the oceans as a whole depends on these tiny engines of life. Understanding how marine microbes live and die allows us to take better care of the oceans and the whole earth system. Naomi Levine, Gabilan Assistant Professor of Biological Sciences and Earth Sciences at the University of Southern California, takes a multidisciplinary approach to understanding the life and times of a marine microbe. Levine takes puzzle pieces from different disciplinary silos – evolutionary biology, fluid dynamics, and genetics – and puts them together in novel ways. “We learned something new about the system which we couldn’t have learned by looking at all these different disciplines independently,” Levine said. Levine in early September presented new research at MIT to an audience of faculty and students about how marine microbes will adapt to and evolve in a changing climate. The room was attentive and hushed. Her motivation? Marine microbes impact “things that we as humans care a lot about,” Levine said. She gave as examples “charismatic megafauna like dolphins, whales, and fisheries.” Whatever happens at the base of the food chain moves up. Levine’s work teases apart the biological and physical mechanisms that drive the rate of carbon cycling in the ocean. “We’re trying to identify where shifts in microbial dynamics might feedback on climate dynamics,” she said. 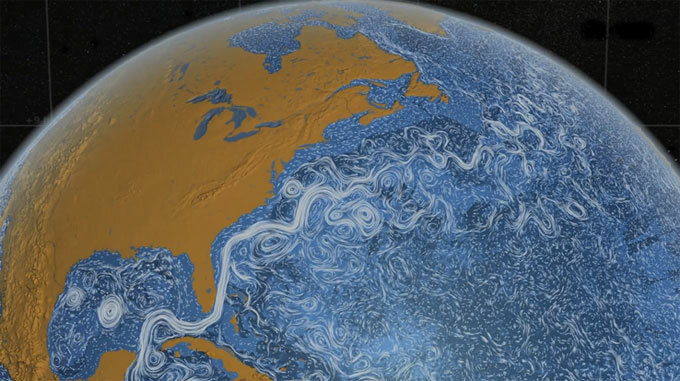 The planet’s oceans are a vast and complex fluid system. Constantly in motion, microbes are swept along in eddies, where they experience physical changes in temperature, light, and nutrients. Levine explained to the MIT audience that she is striving to develop a more data-driven and refined picture of how microbes respond to their environment: the fluctuations that one organism of microalgae or archaea experiences over the course of its lifetime. On a long time scale, evolution and selection processes come into play. Visualize Darwin’s finches – their diversity in beak form and function. “Eventually, they’ll evolve to be more perfectly adapted to their environment,” Levine said. This change is heritable: A microbe passes its genes onto its offspring. Levine’s work zooms in on the middle time scale, between short and long. For a microbe, that’s several months. Epigenetic changes are chemical modifications to DNA, RNA, or proteins that often affect an organism’s phenotype, for instance how it grows. Epigenetics are faster than genetic mutations. Unlike phenotypic plasticity, epigenetic changes are heritable. And unlike evolution, epigenetic changes are reversible. This is an intermediate stage between adaptation and evolution. Levine and her researchers (including Nathan Walworth, Emily Zakem, and Erin McPartland) made selections based on fitness. They tested this hypothesis using an epigenetic model of statistical evolution coupled with a global circulation model. The statistical model considers the rate of trait evolution in a broad sense, in terms of fitness gain. In the model, individuals undergo mutations in the form of a directed random walk, which can either increase or decrease their fitness. These changes are either advantageous, deleterious, or neutral. Levine and her researchers made selections based on fitness. At each timestep, marine microbes with lower fitness levels would die. Evolution experiments have previously involved running models that expose organisms to a new environment. Levine, though, keeping the variability of ocean eddies in mind, wanted to ask about periodicity. She wondered what would happen if an organism witnessed a new environment only for a certain period of time, and then returned to the previous environment, or to a different one entirely. When organisms moved out of the selective environment, Levine said, she started to see selective sweeps. Organisms would have varied levels of fitness until one hit on a beneficial mutation, and that mutation then would sweep through the population. The initial variability in fitness for the new environment is driven by epigenetic changes. In contrast, though, the sweep results in a genetic mutation fixing in the population. Time, in this case, matters. Depending on the interval length, the organisms either would or would not develop the sweep. If the fluctuations are too frequent, epigenetics is driving the show, and the researchers never saw the selective sweep, as no genetic adaptation occurred. At longer interval lengths, sweeps occur in multiples. But if the fluctuations were too frequent, plasticity, but not adaptive evolution, would come into play. A more textured understanding of the mechanisms and timescales of marine microbe evolution will give increased resolution to current ocean carbon cycling models. A shift in the types of organisms that populate the surface of the ocean, even a tiny shift, translates into magnified impacts up the food chain. Earth at the level of micrometers is still that: life, beautiful for its complexity. Devi Lockwood is a freelance multimedia journalist currently in a one-year master’s degree program in science writing at MIT.